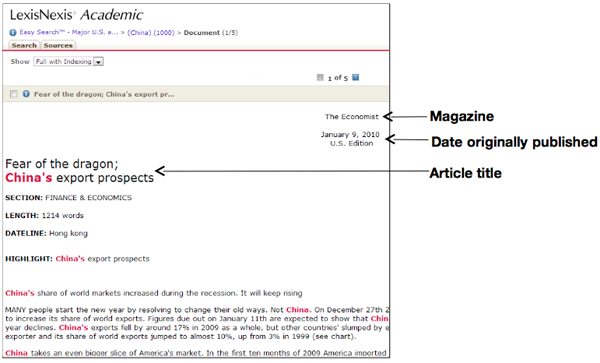 Structure: Last, First M. “Article Title.” Magazine Title, Month Date, Year Published. Citation: Rothbart, Davy. “How I Caught up with Dad.” Men’s Health, October 2008. 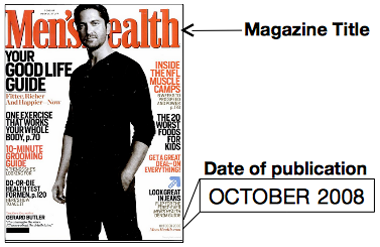 Structure: Last, First M. “Article Title.” Magazine Title, Month Date, Year Published. Accessed Month Date, Year. URL. Citation: Rothbart, Davy. 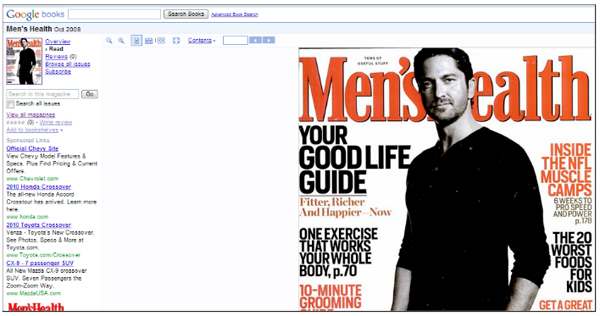 “How I Caught up with Dad.” Men’s Health, October 2008. http://books.google.com. *URL Note: Only include if URL is stable. If none, use database name instead. Citation: “China’s Export Prospects: Fear of the Dragon.” The Economist, January 9, 2010. LexisNexis Academic. Structure: Last, First M., and First M. Last. “Article Title.” Magazine Title, Month Date, Year Published. Accessed Month Date, Year. URL. 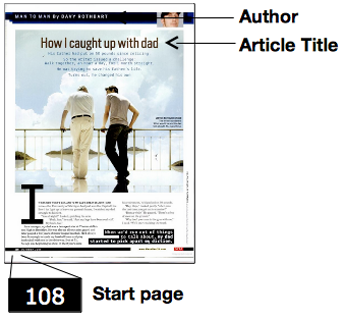 Online Magazine or Website? Because we cannot identify separate in print publication information, we can assume this source was published either online only, or simultaneously online and in print. We therefore do not need to account for standard magazine publication information, but instead, mainly website information. Such information will help your reader identify the source. Citation: Nasar, Sylvia, and David Gruber. 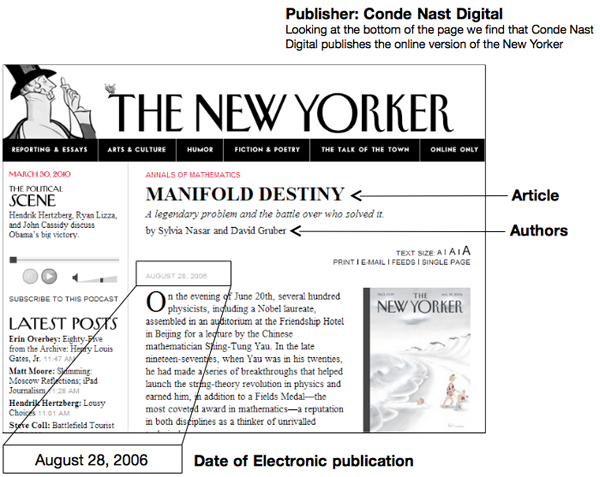 “Manifold Destiny.” The New Yorker, August 28, 2006. http://www.newyorker.com.